John Mounce is holding Clifden Clowers and Waimate club president Alex Colvill has a historic trophy he won when the horse went past 100k in stakes, late last month. When a horse is 10-year- old and has raced over 150 times, it is supposed to be getting a bit tired and slowing down. Particularly when said horse used to live in Blenheim and most of those races have involved long road trips. But the opposite has proved the case with Clifden Clowers, who has been in career best form in recent months, winning three races and $24,000 while hardly being out of the money in 15 races this year. When Clifden Clowers recorded his latest win, at the Waimate meeting late last month, it was his 12th win from 157 starts and took his earnings past $100,000. He is in his ninth season of racing after one start as a juvenile and along the way he has also recorded 11 seconds, 20 thirds, 13 fourths and 17 fifths, for an awful lot of ‘cheques in the mail’. Clifden Clowers has been in particularly good form since winning at Waikouaiti in late February. He has raced seven times in the last six weeks for two wins and four placings with his only unplaced run at Addington on a premier night behind Kings Landing and several open class trotters. Two days later he won at Waimate and there’ll be no surprises if Clifden Clowers comes off the backmark and wins again at Forbury Park tonight (Thursday). Clearly something has been going on here and it has been a combination of factors, according to John and Sandra Mounce. The latter trains Clifden Clowers for John and his twin brother in fireman Les and older brother Tony, a well-known mortgage broker in Christchurch. For a start, Clifden Clowers was once good enough to be Group 1-placed, although people can be forgiven for forgetting about his third in the 2012 NZ Trotting Derby behind Escapee, given it was seven years ago now. “Dexter Dunn drove him that night and he would have been second, but for trotting a bit roughly in the run home,” said John. “Then he got quite sick and his condition dropped right away and his four-year-old season was a write-off. “He’s always had this condition called stringhalt, which causes a sudden and exaggerated flexing of the hind legs and it’s very unusual for a racehorse to last very long with it. 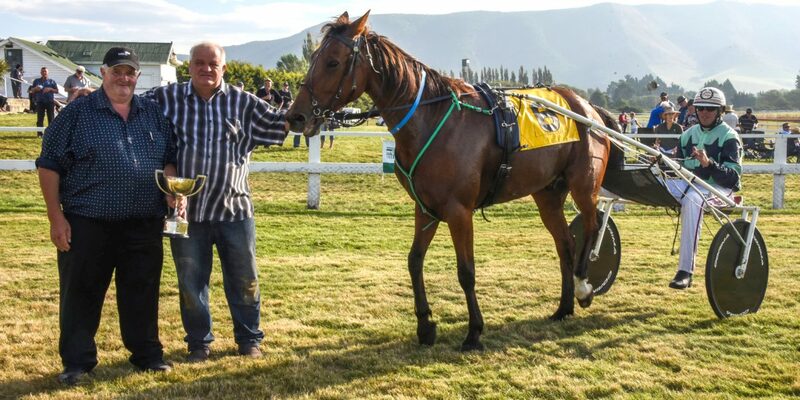 The Mounces moved from Blenheim to Geraldine a year ago and another aspect of Clifden Clowers’ improvement has been paddock training him and trips to work around the outside of the Orari track. He has also been racing without shoes or any shin or knee boots for the last three months. “He’s basically been racing completely naked and takes about one minute and 45 seconds to gear up. “He’s a beautifully-gaited horse and that’s why he loves the tight, turning tracks like ‘the mighty Manawatu’ and Reefton. “Stringhalt can be managed and Sandra has done a great job getting on top of that – he has to warm himself out of it. Horses are very much a family affair for the Mounces with John’s father Trevor having the distinction of taking on an old and broken down Mighty Chief and winning with him at Addington at the National meeting in August, 1971. Mighty Chief, who won the Dominion in 1965, was an 11-year-old that night and the rank outsider for the Winter Handicap, paying $85 when coming off 24 yards to down Tony Bear and Merrin. Two starts later Mighty Chief won a Free For All in Greymouth and he was still racing well at the age of 13. Another older brother of John’s in Peter was a prominent horseman in the 70s when he worked for Charlie Hunter in his Young Quinn days. The Clifden Clowers story really begins with Tony Mounce, who raced the third dam Culpepper, a daughter of Game Pride. She won her debut at Motukarara in April, 1994, for trainer Bruce Hutton and driver Jim Curtin. Culpepper’s first foal was the Gee Whiz filly Miss Theegee, who would credit Sandra with her first training success when she won a race at Forbury Park in 2002. Miss Theegee’s first foal was the Sundon filly Gina, who began racing with a second at Nelson in the New Year and who would line up in the Hambletonian and Trotting Oaks under trainer Ken Barron. “Gina had a lot of speed but she was one of those Sundon fillies that lost it mentally. “She got hit in the head by a bell boot in a race and from that point she would over race. Clifden Clowers is the first foal from Gina, who has since proved very difficult to get in foal and the now rising 16-year-old has produced only four foals over the years. Alan Clark borrowed her to breed a winner in Cocktail Waiter and now John has a three-year-old filly by Majestic Son in Time In A Bottle with trainer Michael Ward that they have high hopes for. “She has a lot of speed but needed a soft palate wind operation after she began racing in January. “That appears to have been successful and she’s now back in full work. Gina has since produced a yearling filly by Superfast Stuart which is going to be called Bernell Clowers, while she is now in foal to Creatine, a horse who reportedly has a very good temperament. The name Clifden Clowers comes from a well-known country and western song called Wolverton Mountain, which was about a fellow called Clifton Clowers who was rather over-protective about his daughter, Bernell. The Mounces bred a number of foals from Miss Theegee including several by Sundon although the only other one that worked out alright was The Great Pretender. She won her debut as a two-year-old at Washdyke for trainer Warren Cochrane which put her into the Jewels at Ashburton a few weeks later, but she went for an early gallop. The Great Pretender would produce a couple of winning fillies in Fira and The Great Redeemer before being lost to cancer a few years ago. Fira, also by Thanksgiving, won a race for Stephen McNally a couple of years ago and another one for Arna Donnelly at Cambridge last month. McNally produced The Great Redeemer to win a race at Ashburton in February last year, where she downed Majestic Hurricane, Winterfell and Kings Landing, but she was unplaced in the Southland and NZ Trotting Oaks before being sold to Danny Zavitsanos, the owner of Cruz Bromac and Enhance Your Calm. The Great Redeemer was third in the Breeders Crown won last year by Show Gait and she has since won three races, the latest at Melton last month by 21m for the Gaths. Kate and Andy. Before Clifden Clowers and Paul’s Verdict, who won his eighth race for John Mounce at Forbury Park last week. Sandra had trained one other winner in Lightning Play. He’d won five races for Jim Dalgety before she took him on as a veteran claimer and he won a race at Addington, again as a rank outsider and paying $86 in what was one of the last winning drives for Jo Herbert in 2009. John and Sandra Mounce have run motels for many years starting with the Bluegum Motel at Weedons, hence the name of another horse they raced in Bluegum Motel Shines, who won three races under Cochrane. That motel has now made way for the new motorway and the Mounces then ran the Two Tree Lodge in Blenheim before moving to Geraldine and the Four Pegs Motel. Cochrane would wind up in Australia although Clifden Clowers was always going to be a project for Sandra given his issues and between him and Paul’s Verdict, she has won 19 races with them after winning two in the decade prior. “I leased Paul’s Verdict after he’d begun racing for Grant Payne and exercised the right of purchase a couple of months ago. “He’s been a handy horse because he’s got good gate speed, although he’s benefitted greatly from the ratings handicapping system and he’s nothing like Clifden Clowers. Don’t be surprised to see still him going well aged 13, ala Mighty Chief some 50 years ago.